Some time ago Massachusetts policymakers, frustrated by the 30-second soundbite on the evening news, started looking for a better way to reach their constituents. Around the same time, PBS coverage of government events was on the decline, due to funding shortfalls. 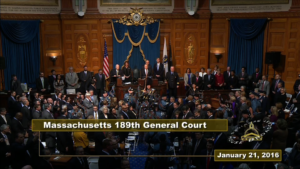 So the Massachusetts House of Representatives took matters into its own hands and started a media department dedicated to recording legislative sessions, hearings and press conferences. These recordings could be seen on the House website, or on any PEG station that asked the House to send them a copy. But there was a problem. The only means of distribution, back in the day, was sending a DVD by snail mail. Donald Coleman, Dir. of House Broadcast Services, describes the conundrum: “There wasn’t a time or cost-efficient way of distributing content to PEG at the time. 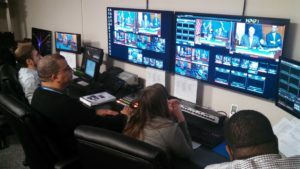 It wasn’t until we became aware of TelVue and Mass Media eXchange that there seemed to be a real solution to our dilemma.” The Governor’s office was thinking the same thing, and before too long, both had signed up to the Mass Media eXchange (MMX), a digital program-sharing “private group” managed by Mass Access on the TelVue Connect cloud-based video platform. Now they have immediate access to the Mass Access coalition of more than a hundred PEG stations across the state. MMX allows MassAccess members to share programs through a simple drag-and-drop browser interface. Upload the video file through a webpage, and the program is automatically transcoded to the station’s preferred broadcast format. One more click will either distribute the program to a TelVue server, or download for replay anywhere. “It was a huge plus for us,” says Mass Access President Bill Nay, “MMX is so easy to use. The State House just has to upload once, and all MMX members get notified when a program is added.” As a test, the House put up a press conference last December. It was downloaded by 17 stations, reaching a potential audience of half a million. The legislature was convinced. “Our collaboration with Mass Access fulfilled something we’ve been trying to do for a long time, which is to broaden distribution. To reach constituents who don’t necessarily go to the Web for information,” Coleman explains. It was a win-win situation. The government needed to reach more of the public. A lot of PEG cable channels needed more hours of relevant programming. The MMX platform is in fact a re-incarnation of MyMassTV, based on an earlier-generation program-sharing TelVue platform, but without the transcoding power and web-based uploading features of TelVue Connect. MyMassTV, in turn, was propelled by the PBS stations’ decision to stop covering legislative sessions on a regular basis. But though the technical platform has changed, the original idea, as Bill Nay put it, remains the same: provide a way for state organizations and the governor’s office to get their message out to the entire state. The MMX has been used for a wide variety of programming since its inception in 2014. Access to MMX programming is one of the member benefits of Mass Access, which also provides professional conferences, training, and networking opportunities for its members. With more than one thousand videos to share, MMX members have a deep pool of programming resources to draw on, ranging from news shows, entertainment, local history, variety, and programs focused on social issues of interest to Massachusetts residents.